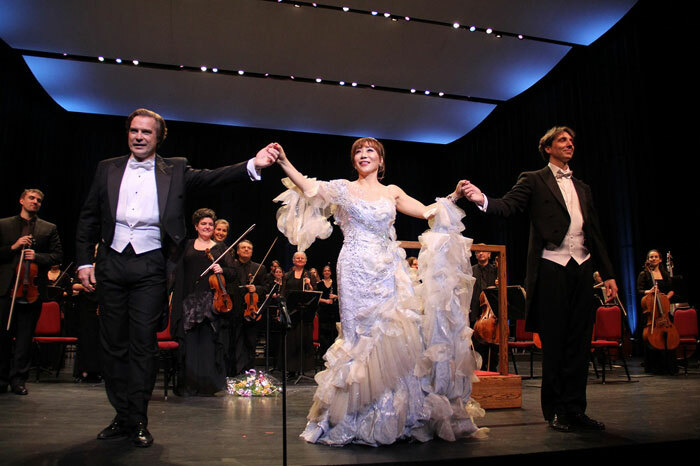 Soprano Sumi Jo (center) poses for a photo with baritone Jean-Francois Lapointe (left) and conductor Jean-Michel Malouf of the Orchestra de Chambre I Musici de Montreal during a concert on November 26 at the National Arts Center in Ottawa, Canada. My hometown is on the southern waters. I can see the blue ocean in my eyes. How could I forget even in my dream the serene waters of my hometown. The melody of the song “Gagopa” (“I Wish I Could Go”) echoes across a concert hall in Ottawa. The audience falls for the clear and beautiful voice of Korea’s world-class soprano Sumi Jo. 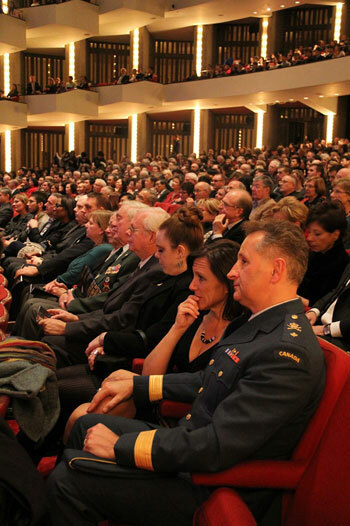 This is the concert Jo held in Southam Hall at the National Arts Center in Ottawa, Canada, on November 26. 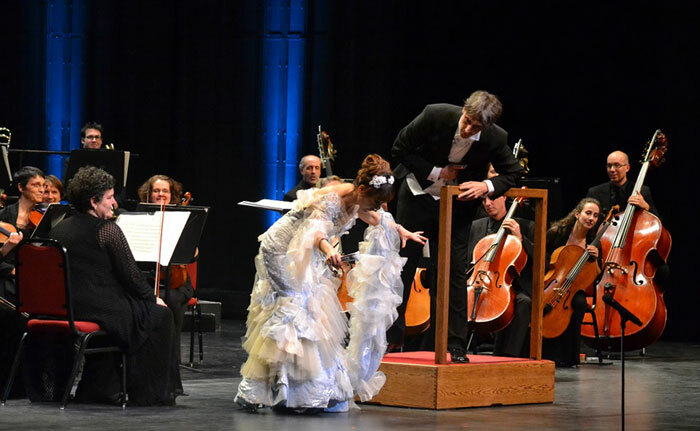 Soprano Sumi Jo (center) bows to the audience during her concert at the National Arts Center in Ottawa on November 26. 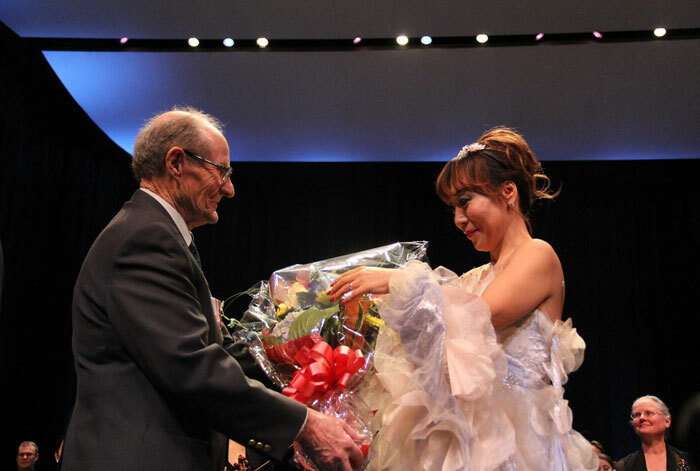 Soprano Sumi Jo (right) receives a wreath from William Black, a Korean War veteran who serves as president of the National Capital Unit 7 in Ottawa. The seats were filled with Korean War veterans, including William Black, the Korean War veteran who serves as president of the National Capital Unit 7, and Korean residents of Ottawa. Korean War veterans, their family members and Korean residents of the capital enjoy the concert by Sumi Jo in Ottawa on November 26. War veterans who appreciated the concert all thanked President Park Geun-hye for such a wonderful concert after paying a state visit to Canada and delivering words of encouragements to war veterans in person this past September. They added that they fully felt the gratitude from Koreans for the Korean War veterans. “I’m deeply honored to deliver the gratitude of Koreans on their behalf to the war veterans of the Korean War and their family members,” said Sumi Jo. “This is the first time for me to hold a concert in Ottawa, and I am glad to collaborate with Canada’s leading orchestra with the best conductor and the best baritone in the country,” she added. “Sumi Jo’s concerts are a gift from the Republic of Korea for the war veterans and their family members and for the Canadian people. This event will offer an important opportunity to further develop the bilateral relationship,” said Ambassador Cho. Sumi Jo will meet again with Canadian fans at the Maison Symphonique de Montreal, in Montreal on December 1.